Calamy says he was minister of Claybrooke in Leicestershire, but does not say when. and, upon the death of Dr. Samuel Ward, in September 1643, he was elected master of Sidney-college in Cambridge, from which, Dr. Walker says, he was kept out “by the oppressions of the times;” but there was also somewhat of court-intrigue in this affair, as related in Walter Pope’s life of bishop Ward. He tells us, that upon the death of the latter, the fellows of the college assembled to choose a new master. “Mr. 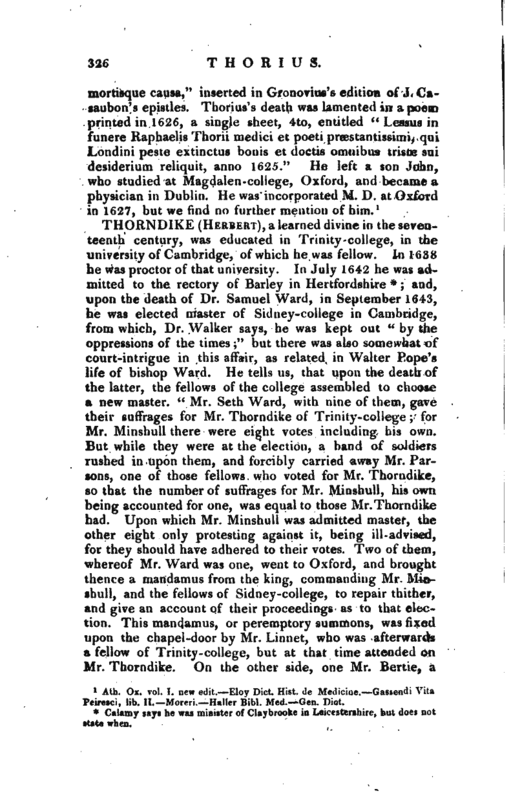 Seth Ward, with nine of them, gave their suffrages for Mr. Thorndike of Trinity-college; for Mr. Minshull there were eight votes including his own. But while they were at the election, a band of soldiers rushed in upon them, and forcibly carried away Mr. Parsons, one of those fellows who voted for Mr. Thorndike, so that the number of suffrages for Mr. Minshull, his own being accounted for one, was equal to those Mr. Thorndike had. Upon which Mr. Minshull was admitted master, the other eight only protesting against it, being ill-advised, for they should have adhered to their votes. 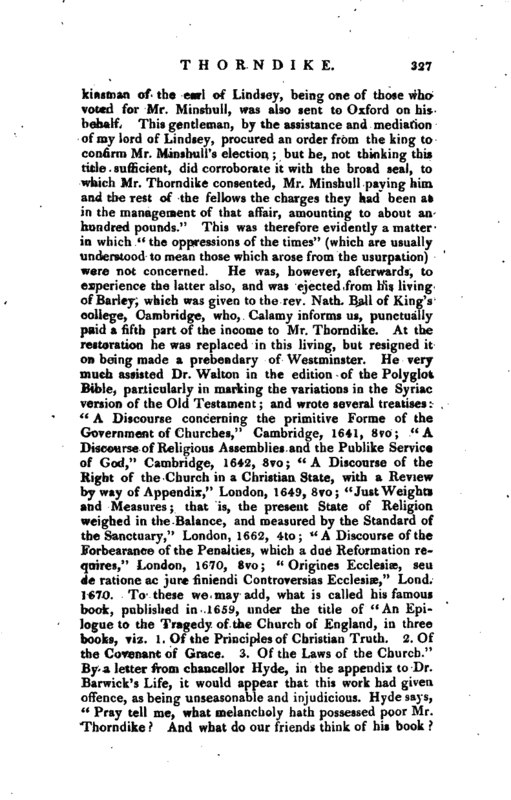 Two of them, whereof Mr. Ward was one, went to Oxford, and brought thence a mandamus from the king, commanding Mr. Minshull, and the fellows of Sidney-college, to repair thither, and give an account of their proceedings as to that election. This mandamus, or peremptory summons, was fixed upon the chapel-door by Mr. Linnet, who was afterwards a fellow of Trinity-college, but at that time attended on Mr. Thorndike. On the other side, one Mr. Bertie, a | kinsman of the earl of Lindsey, being one of those who voted for Mr. Minshull, was also sent to Oxford on his behalf. 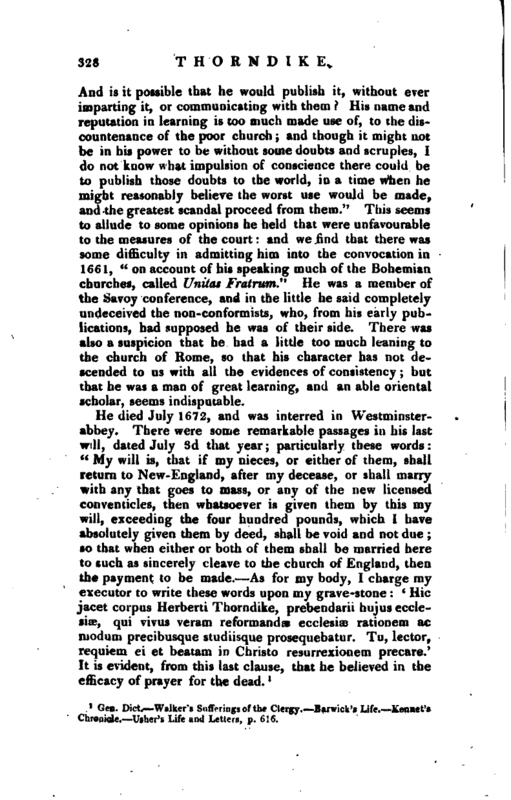 This gentleman, by the assistance and mediation of my lord of Lindsey, procured an order from the king to confirm Mr. Minshull’s election; but he, not thinking this title sufficient, did corroborate it with the broad seal, to which Mr. Thorndike consented, Mr. Minshull paying him and the rest of the fellows the charges they had been at in the management of that affair,amounting to about an hundred pounds.” This was therefore evidently a matter in which “the oppressions of the times” (which are usually understood to mean those which arose from the usurpation) were not concerned. He was, however, afterwards, to experience the latter also, and was ejected from his living of Barley, which was given to the rev. Nath. Ball of King’s college, Cambridge, who, Calamy informs us, punctually paid a fifth part of the income to Mr. Thorndike. At the restoration he was replaced in this living, but resigned it on being made a prebendary of Westminster. He very much assisted Dr. Walton in the edition of the Polyglot Bible, particularly in marking the variations in the Syriac version of the Old Testament; and wrote several treatises: “A Discourse concerning the primitive Forme of the Government of Churches,” Cambridge, 1641, 8vo; “A Discourse of Religious Assemblies and the Publike Service of God,” Cambridge, 1642, 8vo; “A Discourse of the Right of the Church in a Christian State, with a Review by way of Appendix,” London, 1649, 8vo; “Just Weights and Measures; that is, the present State of Religion weighed in the Balance, and measured by the Standard of the Sanctuary,” London, 1662, 4to; “A Discourse of the Forbearance of the Penalties, which a due Reformation requires,” London, 1670, 8vo; “Origines Ecclesiae, seu de ratione ac jure finiendi Controversias Ecclesise,” Lond. 1670. To these we may add, what is called his famous book, published in 1659, under the title of “An Epilogue to the Tragedy of the Church of England, in three books, viz. 1. Of the Principles of Christian Truth. 2. Of the Covenant of Grace. 3. Of the Laws of the Church.” By a letter from chancellor Hyde, in the appendix to Dr. Barwick’s Life, it would appear that this work had given offence, as being unseasonable and injudicious. Hyde says, “Pray tell me, what melancholy hath possessed poor Mr. Thorndike? And what do our friends think of his book? | And is it possible that he would publish it, without ever imparting it, or communicating with them? 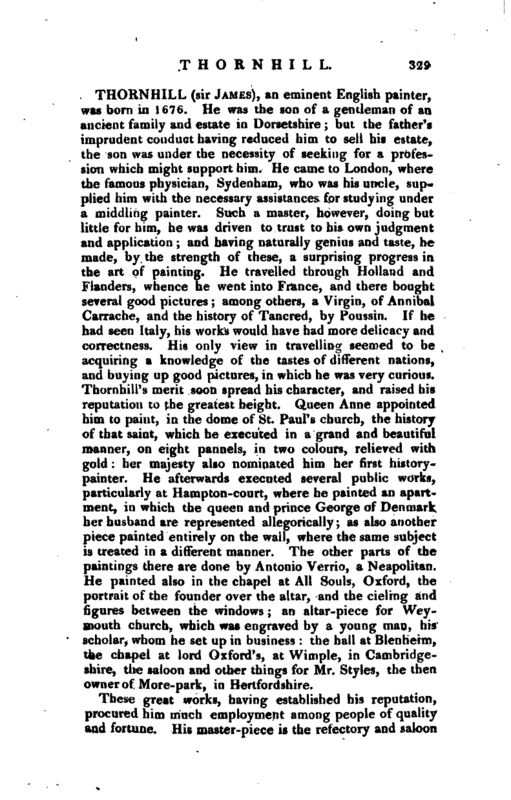 His name and reputation in learning is too much made use of, to the discountenance of the poor church; and though it might not be in his power to be without some doubts and scruples, I do not know what impulsion of conscience there could be to publish those doubts to the world, in a time when he might reasonably believe the worst use would be made, and the greatest scandal proceed from them.” This seems to allude to some opinions he held that were unfavourable to the measures of the court: and we find that there was some difficulty in admitting him into the convocation in 1661, “on account of his speaking much of the Bohemian churches, called Unitas Fratrum.” He was a member of the Savoy conference, and in the little he said completely undeceived the non-conformists, who, from his early publications, had supposed he was of their side. There was also a suspicion that he had a little too much leaning to the church of Rome, so that his character has not descended to us with all the evidences of consistency; but that he was a man of great learning, and an able oriental scholar, seems indisputable. Gen. Dict.—Walker’s Sufferings of the Clergy.—Barwick’s Life.—Kennet’s Chronicle.—Usher’s Life and Letters, p. 616.